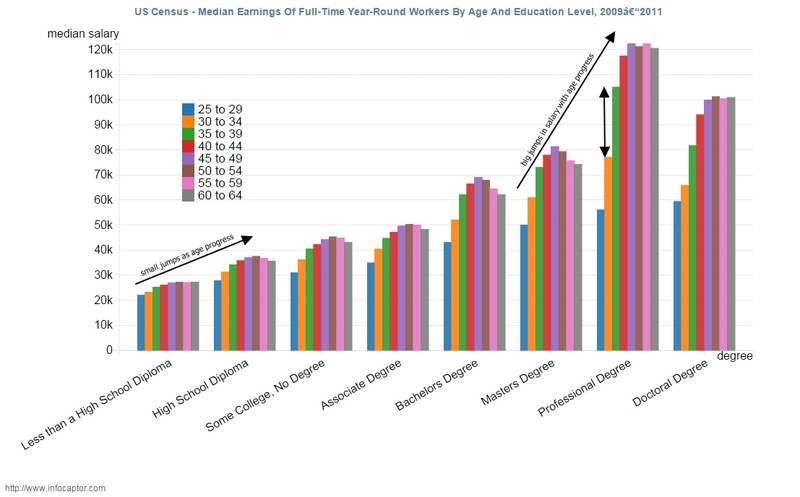 Professional degrees have highest median salary increments. It's still going to be a while. A college degree is more than a certificate that you know certain things. It attests to your ability to commit to and follow through on something, show up on time consistently, complete tasks given to you (whether they are something you love or not), and rounds out the student's knowledge so that they know more than just a limited set of skills. Employers still use that degree as a proxy for a whole raft of other skills and abilities, and despite the cost (blame that on declining government support), it remains the best way for a young person to get their foot in the door. Universities are changing, but anyone who thinks that a college education is in any way outdated is unrealistic. There are several generations of people who value it too highly for it to lose it's worth anytime soon, and there are far too many skeptical of what they will get from the alternatives to trust their business to them on any mass scale. College education is getting more and more expensive and outdated / out of touch with reality. Alternate solutions (apprenticeships) are now being offered, sponsored by hiring companies. I'd expect this will change the value of a college degree in the future - or college will have to redesign themselves. Most are unable to do so because student loans are paid by the government, so they don't face typical business pressures. When you factor in the increasing burden of student loans, combined with 4 years studying where you make no money, and robots increasingly replacing the college-educated workforce, at some point, college education will become a losing proposition.